When I worked in children’s libraries many years ago, I all too frequently heard parents saying to their children ‘You don’t want that book. Put it back. It’s too easy.’ And the child would sadly replace the delightful picture book they had been enjoying. Now, as a trainer who specialises in children’s reading, I find myself equally if not more depressed when teachers on courses say they are not allowed to use picture books with their classes. I’ve even heard this from teachers of year 2 children. Actually, I’m not just depressed. I’m angry. Six and seven year olds should not be deprived of picture books and all they offer. Indeed, no child should be. Here is an eleven year-old boy: ‘You can never be too old for picture books. I used to have a picture book called Giraffes Can’t Dance and I loved it, but my mum gave it away because she said I was too old for it, but I think you can never be too old for picture books.’ I agree. I’m still passionate about them. 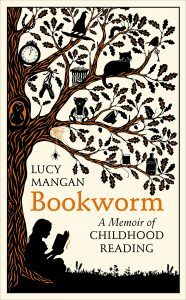 I’ve just started reading Bookworm: A Memoir of Childhood Reading by Lucy Mangan. The tale she tells of the deep bond picture books created between her and her father beautifully demonstrates the very special role they can play in family life. The pleasure of sharing picture books is surely as great for parents and carers as it is for children. Isn’t is interesting how many of us have such fond memories of picture books, can see them in our mind’s eye, may even be able to quote them verbatim, though we might not have held them for years or maybe decades? Picture book creator extraordinaire Nick Sharratt has said ‘I go goosebumpy when I think about the picture books I had because I got so many fantastic sensations from them.’ And I love this from Anthony Browne, another brilliant picture book author and illustrator: ‘The best ones leave a tantalising gap between the pictures and the words, a gap that is filled by the reader’s imagination.’ It’s true, isn’t it? Picture books invite speculation and wonder. Let me quote another eleven year-old: ‘I think picture books are special because they open up a whole new world of thought for the reader.’ Children need curiosity in order to thrive. Picture books help nurture it. Sadly, I can’t tell you what she’s said, but I can tell you about her drawing. 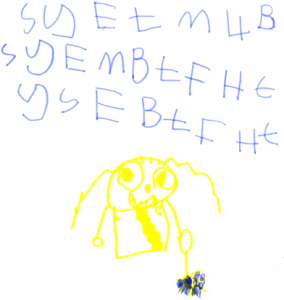 You may not immediately recognise that it depicts a child taking a spider into school on a lead. I know this because one of the books I shared with her class featured lots of children bringing lots of different pets to a pet assembly (does anyone else remember the fabulous Poonam’s Pets by Andrew and Diana Davies? ), one of them a spider. There’s a picture of the spider in the book, but it doesn’t look like this. The idea of the spider on a lead lodged in Dani’s head and spurred her imagination. Earlier this month I was out walking in the snow with friends when we came across a family proudly showing off their snow Gruffalo and the tiny snow mouse by its side. Picture books inveigle themselves into children’s lives in a very special way. Picture books are brilliant for helping children understand the world. I can’t think of many more direct ways to explore the contrasts and the similarities between different cultures than a book like Mirror by Jeannie Baker. 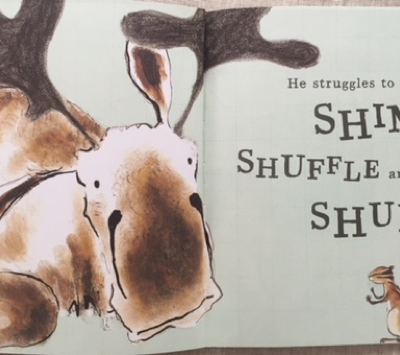 What wonderful resources picture books are for developing children’s empathy. And let’s not forget how amazing wordless picture books like this one are. So accessible to everyone, regardless of reading levels or language. So open to interpretation too, something I love. There is no right and no wrong with wordless books. Which brings me back to all those comments about picture books being ‘too easy’ or, worse still, being ‘baby books’. It makes me so sad that some people see books as texts to be decoded, and fail to realise their potential in terms of enrichment. If I was given a book about accountancy I imagine I would probably be able to read every word. Does that mean I would understand it? Does it mean I would be engaged? Does it mean I would be changed in any way? Almost certainly not. Children deserve and need books that enrich them, change them, help them see things through different eyes, help them understand themselves and others. Picture books do that. They can play such a huge role in children’s social and emotional development. It disturbs me enormously that the appalling cuts in library provision that we are seeing in the UK mean that vast numbers of children will no longer have access to book collections that embody diversity and inclusion. Picture books are also of course superb for supporting literacy. Look at this spread from Ernest by Catherine Rayner, a big favourite of mine. Picture books demonstrate to children that reading is worthwhile. As children’s author Piers Torday says ‘Quality picture books enrich the reading experience and develop great readers for life’. Schools that fail to see the contribution picture books can make to reading skills, reading engagement and reading enjoyment are missing a very big trick. Here’s Anthony Browne again: ‘If children are not encouraged to read for pure pleasure, if they are dragged away from reading books they enjoy – including picture books – and pushed into reading educationally worthy books, then we are in danger of creating a generation of non-readers.’ Thankfully, the majority of schools embrace them. In the middle of writing this paragraph I had a call from someone arranging some training with me. She mentioned using wordless picture books with year 6 pupils and the fantastic play writing that ensued, as well as the pleasure they gave. Philip Nel, an American academic who specialises in children’s literature, tells us ‘A picture book is a portable art gallery. It’s also an intricate dance between pictures and words, in which – though neither leads, and neither follows – no step is out of place.’ And here is Maurice Sendak, creator of that immortal picture book Where the Wild Things Are: ‘Words are left out – but the picture says it. 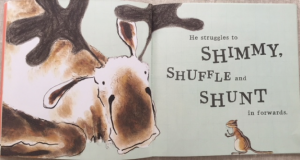 Pictures are left out – but the word says it.’ That interplay between the pictures and the words in good picture books is so often where the richness and the joy lie. I love watching and listening to children as they explore picture books. There have been so many times when a child has noticed a detail in a picture that I’ve never spotted even though I may have shared that book dozens of times, and even though it may shine a valuable extra light on the plot or a character. It happens a lot with young children, who focus exclusively on the pictures because they are their only source of the story before they can read, but I’ve often experienced the excitement of much older children too, when their close reading of the pictures leads to new discoveries, new understanding, extra pleasure. Picture books author and publisher Anna McQuinn has said that if she ruled the world ‘Anyone heard using the phrase ‘you’re too old for picture books’ would be forced to read War and Peace and other long books and not allowed to read magazines, cookbooks, craft books, art books, gardening books (in fact any book with images), to watch movies or TV or to visit an art gallery for 12 months.’ I often end training days about children’s reading by sharing some wonderful picture book. (It’s always agonisingly difficult to choose.) I long ago lost count of the number of adults who say what a treat it is. It’s not about my reading. It’s because picture books have the power to enthral. Anne Harding is an independent trainer. You can find out about her and her work at www.anneharding.net.